You must know by now that unique gifts are always in Fashion with the Muse! I adore unique gifts and what better a gift to give then a unique perfume oil that your friends and family can call their very own! 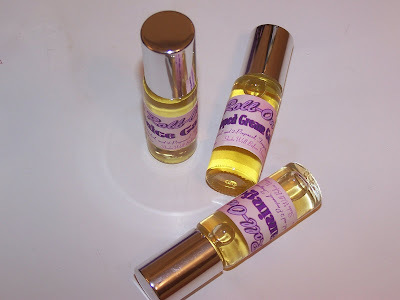 Perfume oils are normally a blend of 50% (or sometimes more) of fragrance oil to base which means they are potent, long wearing, strong, and have wonderful throw! One of the first places you can score some amazing oils would be from Woobie. Woobie offers an array of Bath and Body wonders and delights but the Muse adores the perfume blends that are available! Woobie has a main catalog of scents available and special Holiday editions that change with the season! I can’t begin to tell you the deal you’re getting on these! 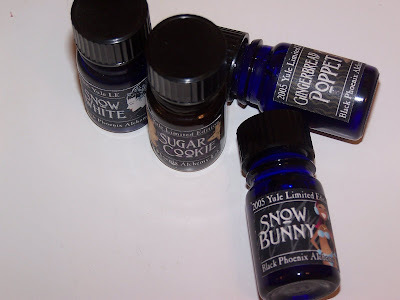 These are high quality inexpensive oils that are available in an array of funky scents! Currently Woobie has three catagories to choose from for the Holiday Season which are Dysfunctional Holiday Oils, Holiday 2007 Blends, and the 12 Days of Christmas! I have some Dysfunctional Oils from last year and I can honestly say the names not only make me laugh but I smell amazing using these! Blitzed – What are the holidays without a few overly indulged relatives? This is the time of year when the best kept secrets and past mistakes are brought out into the open to argue and fude over. This blend has a touch of this, a touch of that and every bit of it is alcohol based. Lump O’Coal – Let’s face it, it is so much easier to be naughty all year. More fun, too. A naughty blend of fresh patchouli, herbal sandalwood, and hints of strawberries, raspberries, and a touch of mint and vanilla. Holiday Coma – It is always an interesting thing around our family. Presents are opened, dishes done, and everyone lays about the den with the game on the big screen. I always thought it looked like a geriatric ward. All the hustle and bustle is finally at an end as the day calmly comes to a close.Chocolate and peppermints. The lovely owner, Penny, has issued a coupon out for readers of Musings of a Muse! You can get 10% off your order by using coupon code MUSINGS. Woobie ships worldwide so if you happen to be in Europe, Asia, or elsewhere Penny will gladly package up your oils to travel to you where ever you are! Thanks to Penny for extending a lovely discount to the readers at Musings of a Muse. Moving on the line you can also nab yourself some pretty sweet Holiday goodies from the Lab (but you might not receive your order in time! Buyer beware!)! If you never heard of the Lab you can drop by my previous posts to read all about it! You can find a helpful post about the Lab by clicking here. Tis the Season for yummie perfume oils from our favorite Lab! Sadly, it’s a bit late to order as normally orders take from 2-4 weeks to process but if you can wait that long you can wander over to this year’s Holiday Collection and nab such wonderful scents as Egg Nog, Gingerbread Poppet, Christmas Rose, Lick It, Mistletoe, and More! You can purchase Yule Blends from now up until January 15th when they take their exit not to reappear until new Christmas! If it’s cute and inexpensive you seek you can run over to Because I’m a Princess and indulge your sweet tooth with an array of funky perfume oils! You can get Three, 5ML Perfume Oil Roll Ons in your choice of scent for $5.75! These are one of my favorite indulgences! The scent lingers all day and they fit snugly into your purse for touch ups on the go! If you’re not loving the idea of purchasing three grab one for $2! 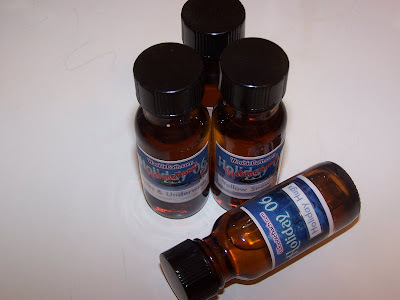 Not so long ago I did a blog entry on Love Potion Magical Perfumerie if you missed the entry you can click here to have a peek! These blends do not come cheap at $24.95 but I can assure you they are some of the best oils I’ve had the pleasure of trying and a unique and funky gift for your good friends or family! I’m eager to place a new order for the Holiday Blends! 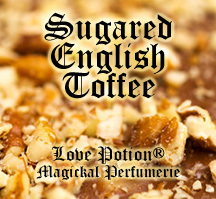 The Scent of the Finest English Toffee – lightly sweetened and subtly nutty! 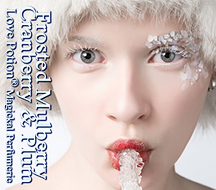 A combination of Holiday Fruits frosted with icy peppermint and pine! The newest Holiday blends can be found by clicking here! An array of goodies await you such as Christmas Cookies, Gingerbread, and more! The generous folk at Love Potion extend a wonderful discount to readers of Musings of Muse! $5 Off Your First Order of $24.95 or more by clicking here plus you must enter the code MUSE on the Paypal invoice section when paying! If you join Love Potion’s forum you can also recieve 2 generous size samples of oils of your choice! 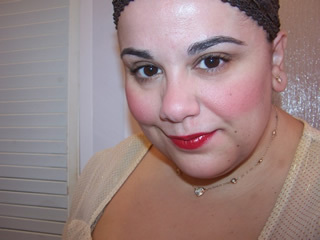 Visit Love Potion’s site for further info about joining their forum! Thanks to Mara and everyone at Love Potions for extending this discount to the Muse’s readers! Last but never least would be something I’ve babbled about in the past as well! Which is Starring Fragrances! 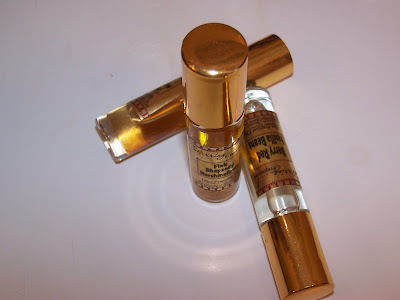 Starring has a wide array of scent and fragrance available and one of my favorite items would be the Roll On Perfume Oils! For $5 each you can’t beat the price! Tuck a few into a stocking and give your mate a unique gift! There you have it! Five Fantastic Shops with a zillion different perfume oil options to give as unique gifts or grab for yourself!